It might be about four months late, but the UK is finally getting its slice of the tasty new Palm pie. There'll be no shortage of outlets to buy this from, with the Carphone Warehouse, Phones4U and O2's online shop all stocked up, but the carrier options are limited to just one. 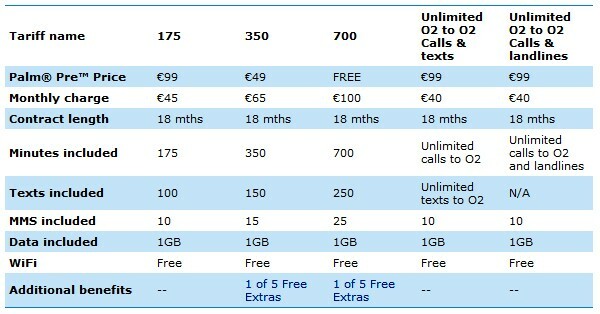 You'll find tables of UK and Ireland pricing after the break, and you'll be happy to know that the Pre can be had for free on two-year contracts charging £34.26 per month, which come with "unlimited" mobile data and free access to the BT OpenZone WiFi service. Update: Good news for our Teutonic brethren, as O2 Germany has also let slip news of the Pre hitting Deutschland on October 13, with the device priced at €481 without contract or cheaper with.